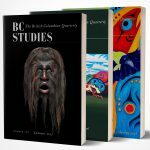 The Winter 2004/05 issue features articles on children and education in nineteenth- and twentieth-century British Columbia. F. Graeme Chalmers is a professor in the Department of Curriculum Studies at the University of British Columbia. He is the author of three books and numerous articles on various aspects of art education. Nic Clarke is a doctoral student of history at the University of Ottawa. He would like to thank Robert McDonald, Chad Gaffield (and other research group members at the University of Ottawa), Leslie Paris, Veronica Strong-Boag, and the readers for their advice and assistance with earlier drafts of this paper. Nic would also like to extend special thanks to his wife, Marcia George. Michael Marker is an associate professor in the Department of Educational Studies and the Director of Ts”kel First Nations Graduate Studies. His recent publications include articles on Indigenous voice and transformation in Qualitative Studies in Education and the Canadian Journal of Native Education and a chapter in Student Affairs: Experiencing Higher Education (2004). Margaret Milne Martens teaches art history at Trinity Western University. She completed her MA in art history at the University of British Columbia. Veronica Stong-Boag is a professor in the Department of Educational Studies and the Women’s Studies Programs at the University of British Columbia where she teaches courses on the history of women, children, and childhood. She is presently working on two books, one on the history of adoption in Canada and the other on the history of Canadian children. She has written about the Mohawk-English Canadian writer and performer, E. Pauline Johnson (Tekahionwake), the suffragist Nellie L. McClung, Canadian women in the 1920 and 1930s, women’s paid and unpaid labour, and early Canadian women doctors.